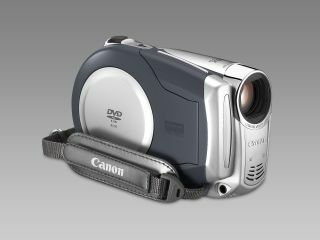 A durable entry-level camcorder that is comfortable and easy to use. It offers good value for money and has a good combination of features. The DC201 is optically what you'd expect of an entry-level DVD camcorder: an 800,000 pixel 1/6in CCD allied with an f2.6 lens. The optical zoom is generous at 30x and there's an 800x digital zoom in the unlikely event that you might be interested in such things. The camcorder records to 8cm DVD-R, DVD-RW, and DVD-R Dual Layer discs and offers a choice of Video or VR modes, which enable you to edit, delete and rearrange footage. At £275, it has a very attractive price that won't eat into your holiday funds too much. If you're not looking for a standalone camcorder, the compact Nokia N93i is an alternative option to take with you. It's easy to use and offers great video output for a mobile phone. Its OLED screen is cleverly fitted into its slick reflective silver fascia, and a Zeiss lens is also mounted at the side of the phone, enabling you to flip the LCD and hold it like an upright camcorder. There are four quality settings, with the best shooting at 640 x 480 resolution, 30fps, and the lowest quality suited to files for sharing with other mobile users. The N93i comes with the Adobe Premiere Elements 3.0 video-editing suite, and a built-in onboard editor that allows you to cut clips, edit them together using digital effects and alternative audio tracks, and then upload them to the web. The Nokia N93i is expensive for a mobile at £200 but is available free on some mobile phone contracts. This sporty mini-camcorder is perfect to pack into your suitcase. It is lightweight, pocketable and has a rubberised shell for extra durability. The Samsung VM-X300 can record DVD-like and MPEG-4 ASP video at 720 x 480 pixels resolution and 30 frames per second. The Samsung VM-X300 is designed for capturing footage when out and about, and can be ready to record in less than three seconds of being switched on. It costs around £250. At £209, the Sanyo Xacti E6 is an excellent entry-level model with a nice camcorder function. Its curved body makes the Sanyo Xacti E6 one of the coolest-looking camcorders around while sitting comfortably in your hand. The nicest feature is its impressive 3-inch screen. Because this camcorder is competent with light, the images on the LCD often look excellent and the size means that it's very convenient showing people your pictures on the device itself. The Sanyo Xacti E6 comes with a 1/2.5-inch, 6.37-megapixel CCD and uses SD and multimedia cards as a recording media, coupled with a disappointing 16MB internal memory. There also a sequential shooting mode, USB2.0 interface, AV out port and cable, WAV audio recording, a flash with various modes and four image quality modes. The Sony HDR-HC7 is a versatile all-rounder that's pleasantly easy to use. It shoots video in DV and HDV modes, and uses Sony's proprietary MemoryStick Duo card format. Priced at £900, the Sony HDR-HC7 offers great connectivity, impressive HD quality, touch-screen controls and is great value for money for the first time buyer or if you wish to upgrade to a high definition camcorder. Also, check out our previous holiday gadgets specials on MP3 players and digital cameras .